The MAXIMUS Foundation continues its tradition of giving with a first-ever donation to Urban Initiatives in the amount of $2,000. 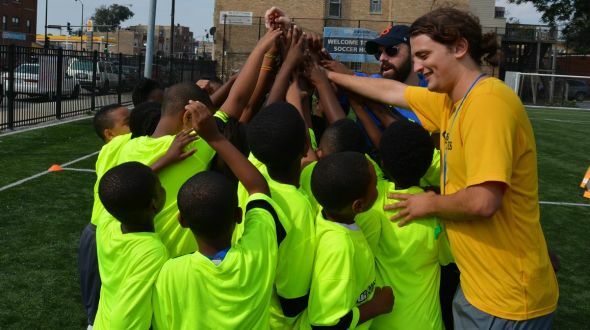 The grant was made to support our flagship Work to Play program and will help us both sustain our high-quality programming at current partner schools as well as expand programming into more schools across Chicago. The MAXIMUS Foundation is committed to supporting organizations and programs that promote personal growth and self-sufficiency through improved health, augmented child and family development, and community development. They are particularly focused providing financial support for non-profit organizations and charities that share our commitment in helping disadvantaged populations and underserved communities. The Urban Initiatives team as well as Urban Initiatives kids and families thank the MAXIMUS Foundation in support of the Work to Play program. Previous Article: Urban Initiatives’ 9th Annual Soccer Ball!